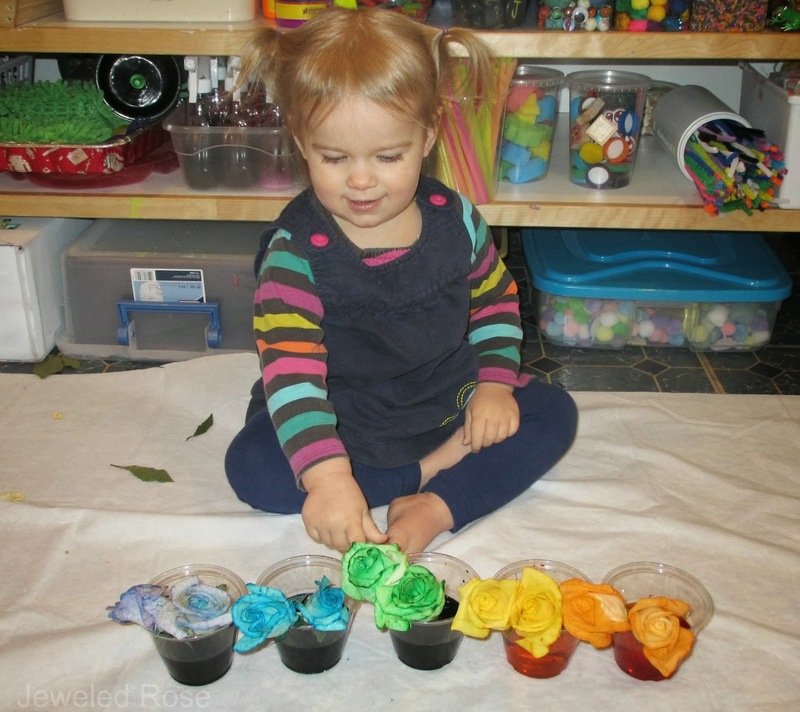 We first tried this science experiment using roses when Rosie was a toddler. Now that my girls are older I wanted to revisit the experiment, this time with a different flower variety so that we could compare our results. 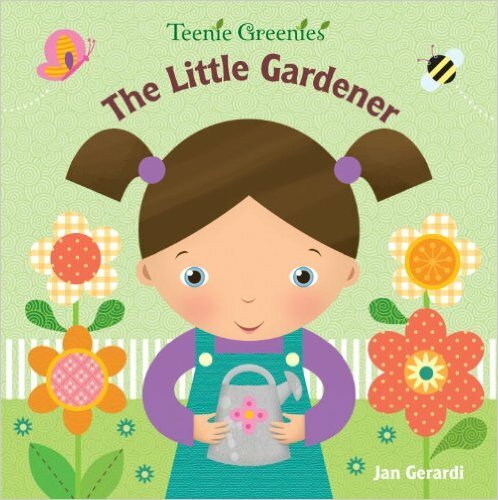 This experiment is great for teaching children about plants and flowers and how they thrive. It is also just plain fun! 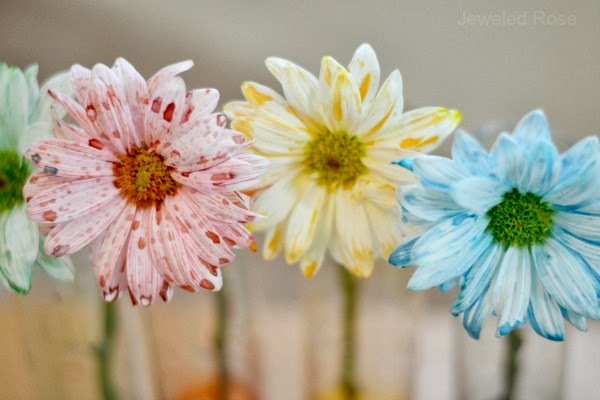 Read on to see how you can turn white flowers into rainbow flowers! You will want to begin with six white flowers. We used daisies this time, but other flowers will also work. 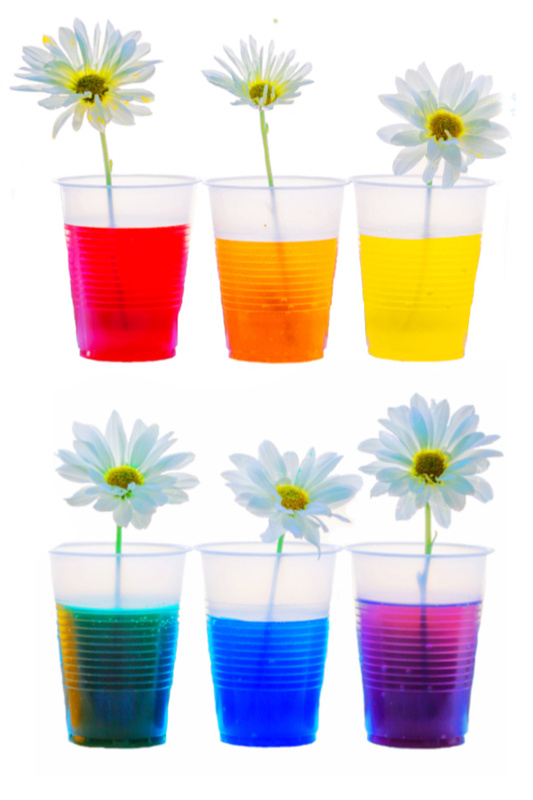 Start by trimming the flowers so that they will fit nicely into whatever cups or glasses you are using. 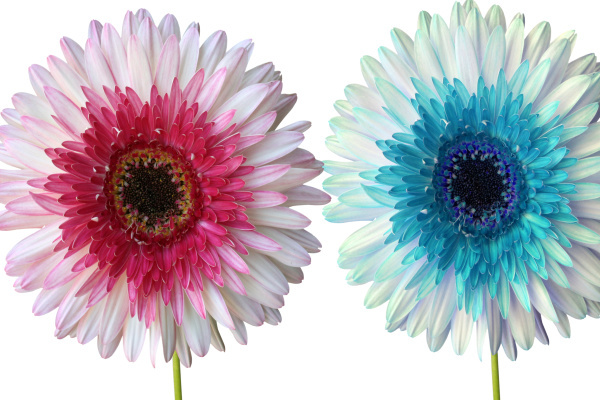 Giving the flowers a fresh cut also helps them to absorb the colored water more quickly. 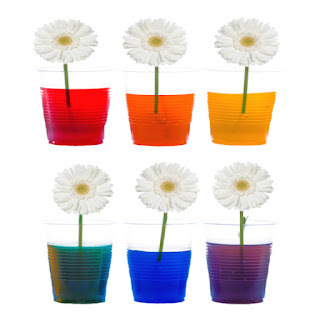 Fill your cups with the desired amount of water, and then have kids add several drops of food coloring and a flower to each cup. 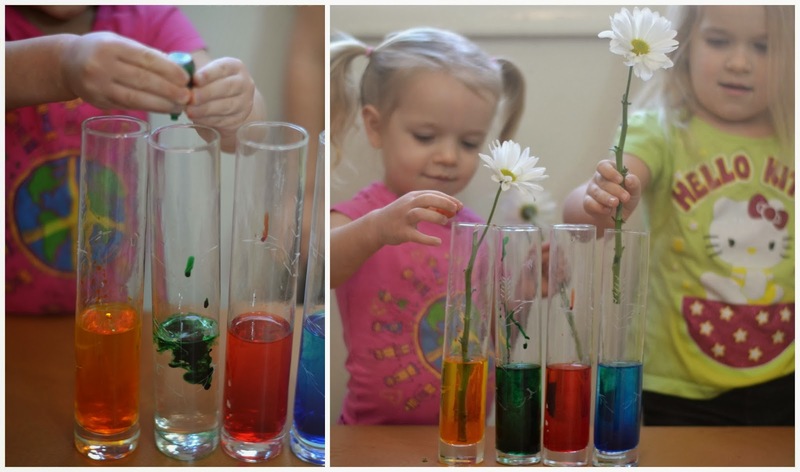 Have kids make observations and hypothesize what will happen to the flowers as they live in the colored water. 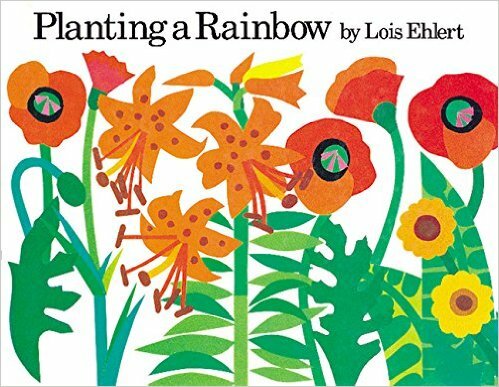 Then, place the flowers in a sunny window. It is now time to observe! 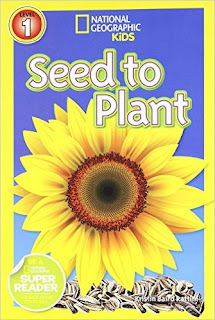 Have kids observe the flowers over the next few days, recording any changes. In just a few hours you will start to notice a slight change! And after a handful of days you may not be able to believe your eyes! 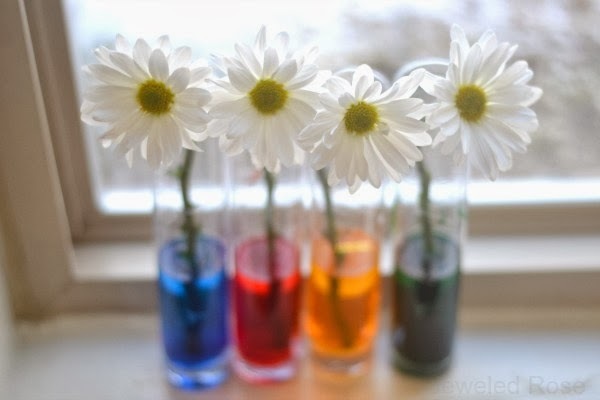 As the flowers drink in the colored water they transform into a beautiful rainbow right before your eyes! 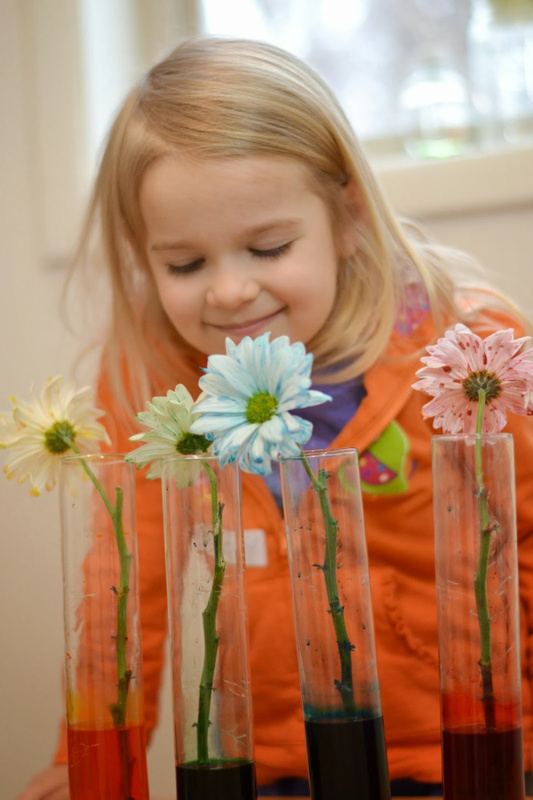 Rosie and Jewel thought this was so cool and were excited to check on their flowers each day! This is what our flowers looked like after 10 days in the water. 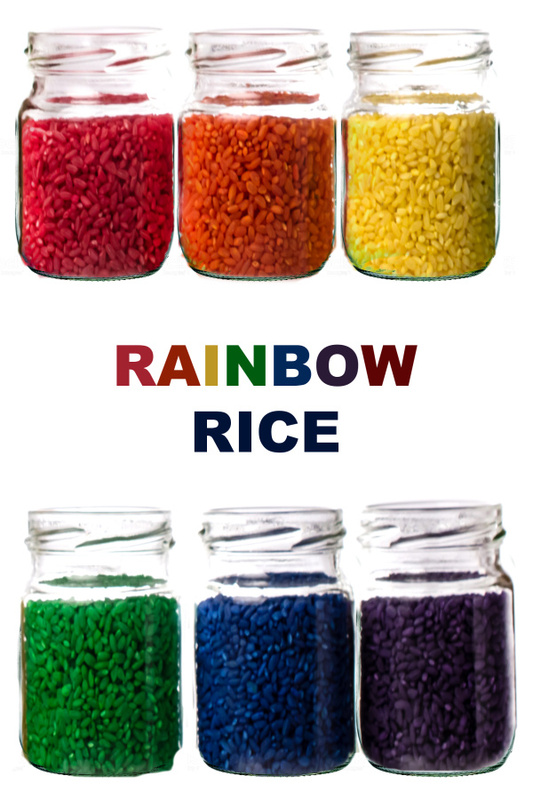 What Did We Learn By Doing This Experiment Again? 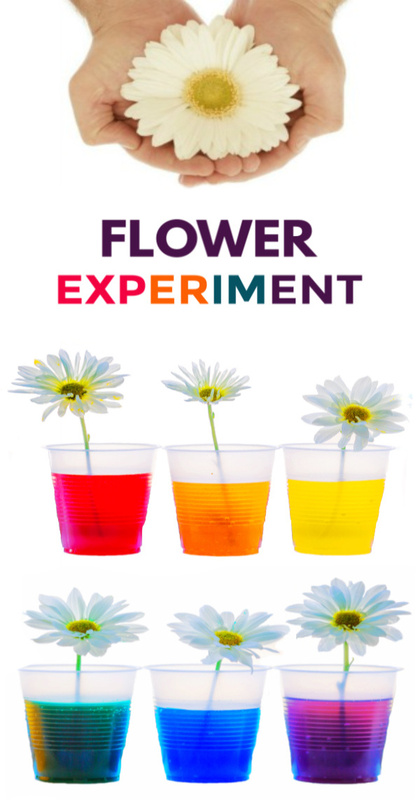 This experiment takes more time with certain flowers. 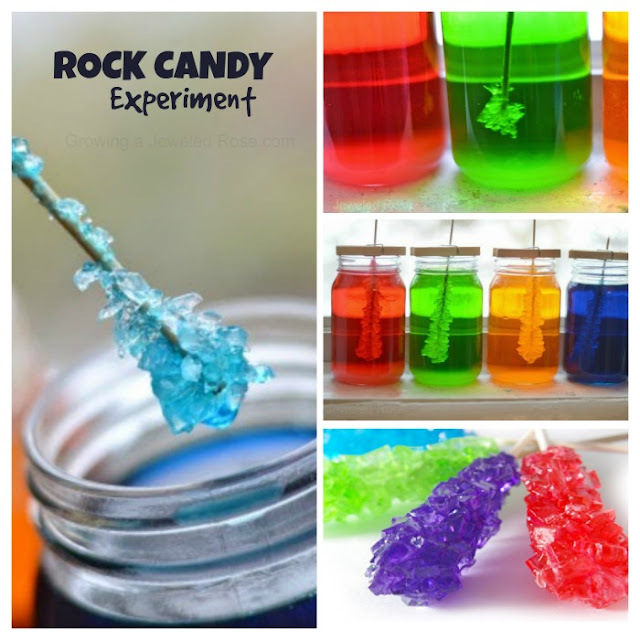 The first time we tried this we used white roses, and those changed color overnight. 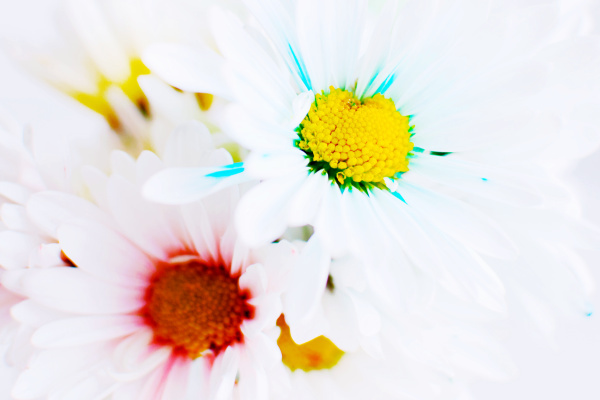 I was surprised to discover that the daisies took much longer. While the daisies started to change after a few days they were not fully saturated until 14 days after we began the experiment. 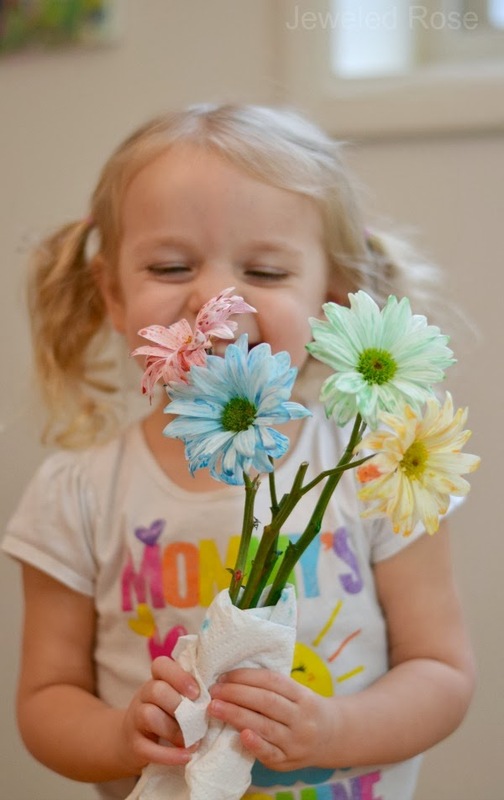 Here is a photo of little Rosie with her colorful roses from the first time we tried this activity. 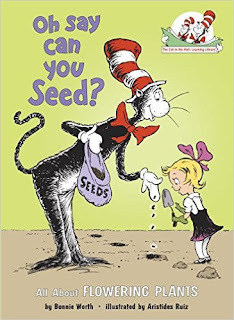 I look forward to revisiting this bit of science with different flowers. I wonder how the results might change? 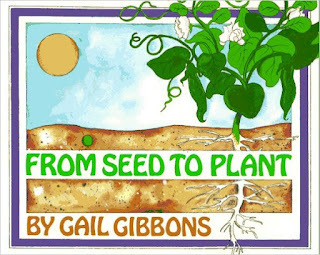 Try this experiment with other plants and flowers. Will this work with celery? What about lettuce? 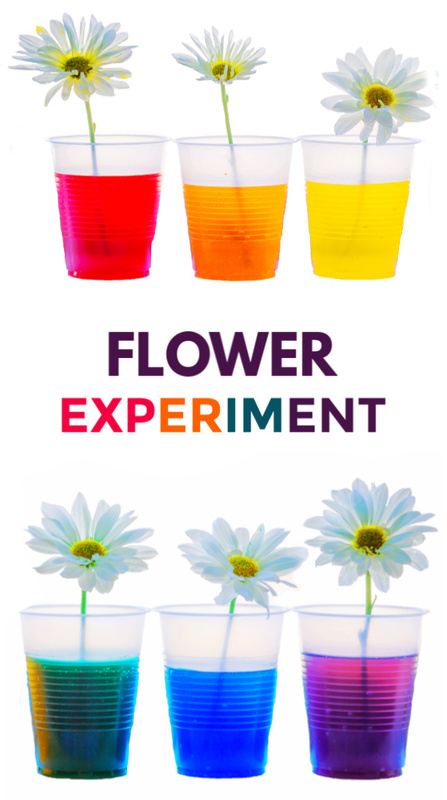 Try cutting the stem of a single flower in half and placing the two pieces into different colors of water. What happens? 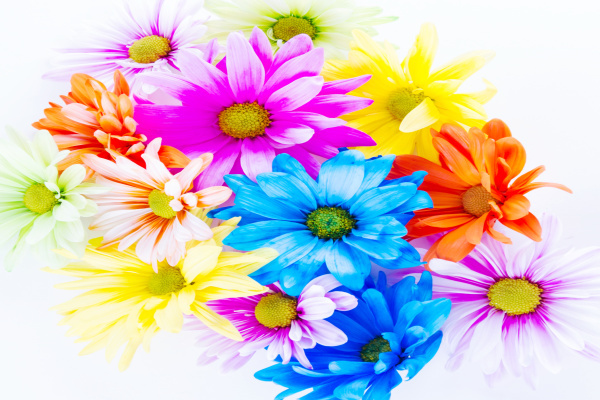 Why do the flowers change color? 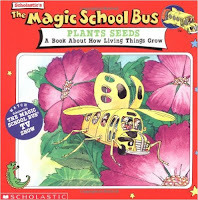 How does the water travel through the flower? 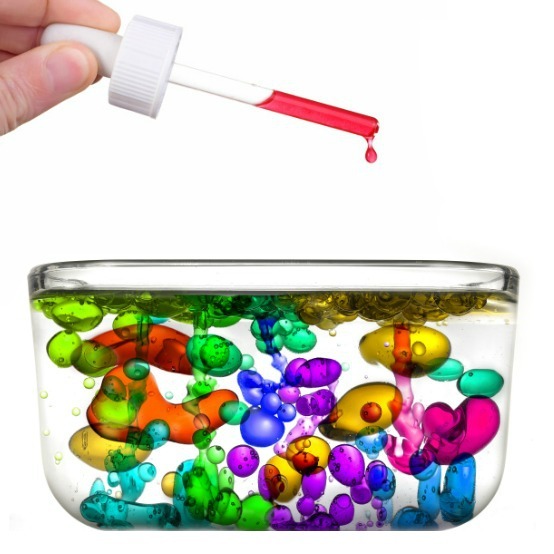 How is the water absorbed? 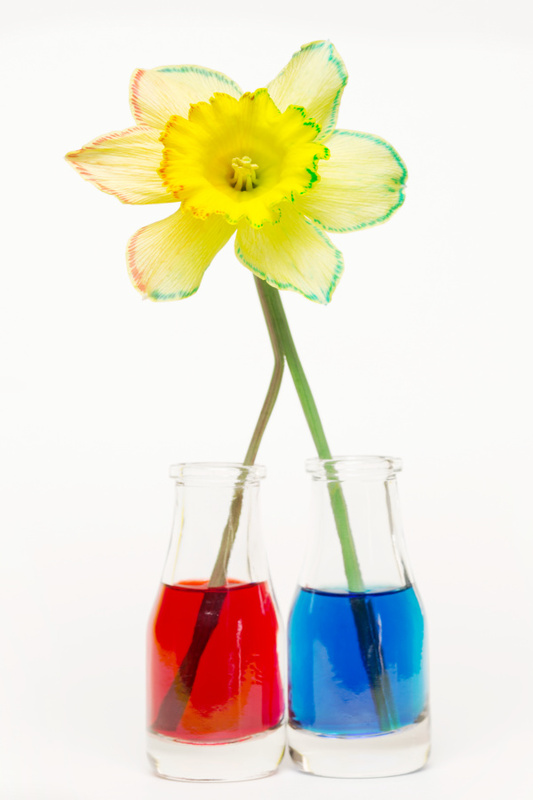 Flower Science: How Does it Work?